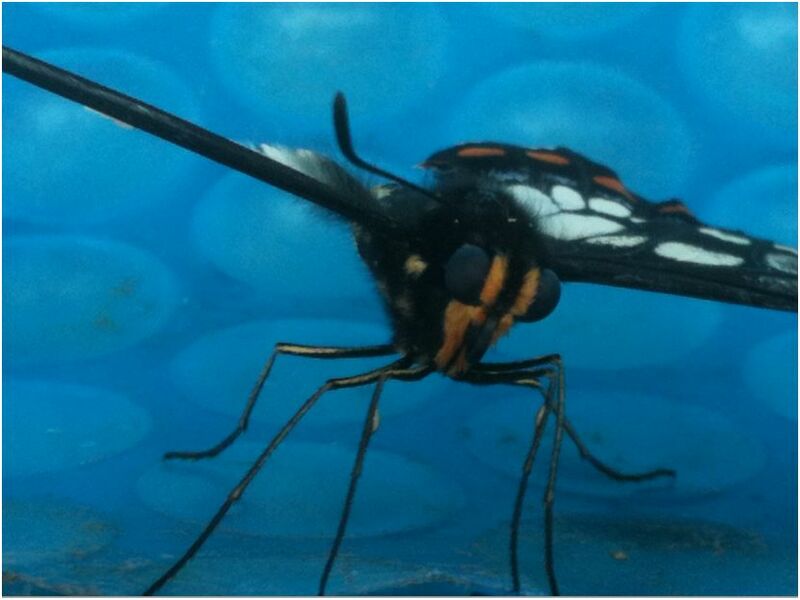 The Japanese enjoy the concept of beauty in imperfection and on Day 12 of the energy exploration year, as I made my way downstairs to feed the dog, I noticed a largish butterfly resting on the pool cover. A closer inspection was made and a series of photos taken and I discovered that this beautiful creature had one of it’s lower wings missing. Not sure if it had not yet unfurled or had been removed by a bird, I decided to leave the butterfly where it was. Later that morning it had gone – I checked under the pool cover but it wasn’t in the water, so I assume it flew away. The opportunity to record it’s presence also reminded me of being present in the here and now, to be aware of the little things in life that present themselves to us, to remind us of our own impermanence. Day 10 of the exploration of energy. The morning session on the zen chi machine seems to be getting shorter as I get used to it. I can feel my lower back loosening up and some of the time is used for arm stretches, which also seems to help in loosening up the spine and in meditating. Today the colours of meditation were greens and yellows. Another warm Melbourne day and the intention was set to use the emWave on arrival at the office – seems like I am becoming a bit of an energy junkie!! However, I attended to a couple of phone messages first and then to writing down the workshop and information evening dates as well as preparing the flyers for the events. 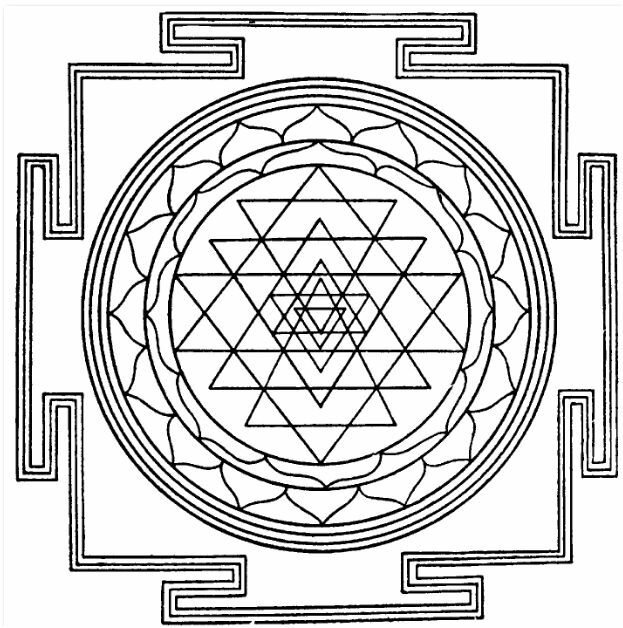 In the process of looking over the Meditation manual, I came across this Mandala and decided to do another New Moon meditation whilst contemplating it. No matter that the New Moon was yesterday, the waxing energy is still there. Writing down my goals for the next month and what inner resources that I have to achieve them, I found that I was focusing more and more on the lotus petals and coloured them in. Each petal now represented a goal and the energy of the Mandala changed. In fact, it changed with each new colour that was added – as I was using the colours of the chakras, took the opportunity to use the meditation as a clearing process. Completing the meditation felt great, there was greater clarity and a really wonderful way to set goals. The flow of energy between friends flows unseen, yet it can be felt. The renewal of old friendships and the gradual lessening of contact and detachment as both you and they move on can be both liberating and in some cases, emotionally painful. Nurturing new friendships, letting go of judgements and observing how the friendship develops can take a certain amount of surrender on our part. Stuart Wilde likens friendship to “the school that you attend, where what you are is reflected back toward you. They act as a mirror. That is why people suffer a lot of imbalance, emotion and difficulty in relationships. They’re looking at themselves and their shadow and that makes them uncomfortable, fearful and angry.” The polarity of friendship is determined by the flow and interaction of energy between people. The yang or outgoing energy is the external social self and is positive. 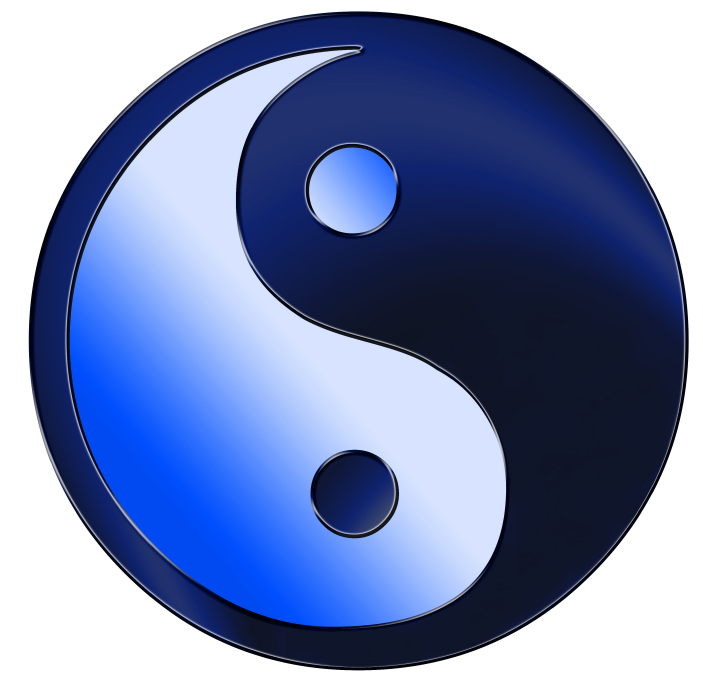 The yin or ingoing energy is the inner body, the spiritual side and holds a negative polarity. The energy to maintain a friendship can ebb and flow and the friendships that are carefully nurtured are the ones that will last a lifetime – or several. The energy of conversation between friends and the energy of positive empowerment and choosing how you spend your time, or how you help others along their paths, all contribute to the polarity of friendship. Sometimes a single word spoken between friends has a profound and lasting influence – it can heal or hurt, so choose the words carefully.What lessons are you here for? What gifts do you have to share? Benjamin Disraeli, the 19th Century British Prime Minister said “Most people go to their grave with their music still in them.”Are you in tune with your own music? Can you express yourself and your needs adequately? Can you surrender to the energy of the friendship and allow the energy to flow organically? If you are feeling that your energy is constantly being drained, then maybe it’s time to let that relationship go. Day 7 of the energy exploration year and noticing how other people’s energy is affecting me. Having the emWave is great as it enables me to record when I have got out of balance and at the same time a great tool to return to balance after a couple of sessions. The zen- chi machine is still in use and the morning session has gone to 20 minutes – loving the feeling afterwards and noticing that I have more physical energy. All good!! Wibble, wobble, jelly on a plate…. …that’s what was going through my mind as Day 5 of the Energy year began and I stepped up the pace on the zen-chi machine. Observing how my body has been responding is interesting – the left side is becoming more flexible and still the right ankle remains stiff and sore. The increased speed also had an effect on my lower sacrum & I very carefully did some lower back exercises before getting up off the floor. I broke my coccyx around this time of year – about 5 years ago, mucking around in the pool and landing on the pool steps. Ouch!! Looking up Louise Hay’s explanation for lower back problems “fear of money. Lack of financial support” came up. Hmmm!! So my new thought pattern is to be “Trust the process of life. All I need is always taken care of. I am safe” as I let go of the constriction in the body and restrictions in the mind. Moving into Day 4 of my year of exploring energy, I have been drawn to the energies of colour. 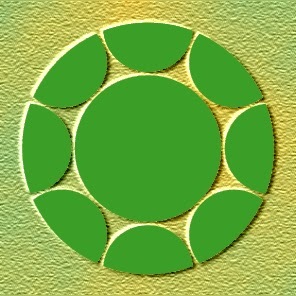 Green is seen as a “healing” colour. It is the colour of balance, one only has to look at the green colours found in nature and experience the relaxation as you look at the leaves, grass and plants and feel their energy. On the physical level, choosing the colour green may indicate an imbalance which may be caused by disease or surgery. Using the colour green in a visualization will help to strengthen the heart chakra. Ayurvedic medicine suggests drinking emerald powder to help improve the health. Wearing emeralds will also strengthen the heart and heart chakra, (Great idea!) and putting an emerald under the tongue is said to help predict events. On the emotional level, choosing to work with the colour green, may indicate emotional issues such as fear which causes the aura to become stagnant and blocked. The Heart Chakra (Anahata) is connected to the lungs, heart, immune system and the arms and hands. The spiritual path of the Heart Chakra is to show unconditional love, not only to others but to ourselves. This means loving how you look, how you feel about yourself, no matter what your size or shape. Having no judgement about yourself or others regardless of any faults or inconsistencies. An exercise for the Heart Chakra is Uttihita Trikonasana – The stretched Triangle – and as you do this yoga pose, bring the awareness to the Heart Chakra and imagine a soft, clear, green light filling your body as you breathe in and as you exhale, expand the green colour out into your aura. Chi (or Ki in Japanese) is all about energy. “Where attention goes, energy flows” – I’m not sure who said that, but I like it! The reason I am focusing on energy is because I’m in the process of writing a workbook to accompany an energy workshop. It took a request from a client to experience a Polarity massage to revisit the practices that I had let lapse. The daily meditation was still in place but since the health issue last year, my personal energy fields are quite depleted. I was eating well – too well – given that I was not as active as I had been before. But something had changed within. Again and again I found myself drawn to the study of energy within the body. Using the emWave daily has helped with finding congruence and the HeartMath material on the energetic heart is great reading. Well, I think so! Another energy system that I use regularly is Reiki – hands on daily and all the better if there is someone to do it for. I have always enjoyed the quietness that comes from giving a Reiki and it took a conversation with another Reiki Master Teacher just recently to realize that I need to schedule some regular classes to teach. Currently I offer “boutique” training, which means that I teach when the student enquires about a class. Another energy system that I have recently revisited is the EMF Balancing Technique and the energy generated by using one of the symbols has been very effective in making some changes to my work environment. Last weekend I dusted off the Zen Chi machine and gave it a go. I did this because I couldn’t get medical clearance to go to the gym and decided to be a little more pro-active in minding my own health. I had forgotten the feeling that is experienced after a session and today is now Day 3 of my new and improved energy program.